Sarkheyli, Elnaz, Rafieian, Mojtaba, Taghvaee, Ali Akbar. (1396). The Evaluation of Megaproject’s Success in Spatial Reproduction of Urban Interests, Case Study: Project of Shohada Square/Mashhad. معماری و شهرسازی آرمان شهر, 10(18), 149-158. Elnaz Sarkheyli; Mojtaba Rafieian; Ali Akbar Taghvaee. "The Evaluation of Megaproject’s Success in Spatial Reproduction of Urban Interests, Case Study: Project of Shohada Square/Mashhad". معماری و شهرسازی آرمان شهر, 10, 18, 1396, 149-158. Sarkheyli, Elnaz, Rafieian, Mojtaba, Taghvaee, Ali Akbar. (1396). 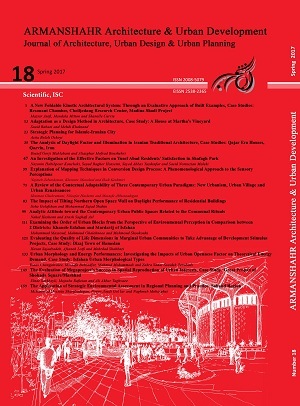 'The Evaluation of Megaproject’s Success in Spatial Reproduction of Urban Interests, Case Study: Project of Shohada Square/Mashhad', معماری و شهرسازی آرمان شهر, 10(18), pp. 149-158. Sarkheyli, Elnaz, Rafieian, Mojtaba, Taghvaee, Ali Akbar. The Evaluation of Megaproject’s Success in Spatial Reproduction of Urban Interests, Case Study: Project of Shohada Square/Mashhad. معماری و شهرسازی آرمان شهر, 1396; 10(18): 149-158. 1Ph.D. in Urban Planning, Faculty of Art & Architecture, Tarbiat Modares University, Tehran, Iran. 2Associate Professor of Urban Planning, Faculty of Art & Architecture, Tarbiat Modares University, Tehran, Iran. 3Associate Professor of Rural and Urban Development Planning, Faculty of Art & Architecture, Tarbiat Modares University, Tehran, Iran.